Room Dr. Najla Attieh 1301, Library Building, Beirut campus. 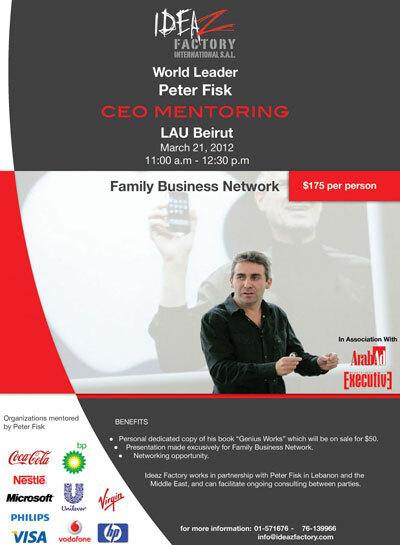 The Institute of Family and Entrepreneurial Business in the School of Business at LAU is hosting a CEO Mentoring workshop conducted by Peter Fisk. For those who wish to participate kindly note that the fee is $175/person - special rate for the Family Business Network members and LAU community. To book your place you can send an e-mail to Dr. Josiane Fahed Sreih on jsreih@lau.edu.lb.